We are pleased to validate three hours of parking for guests who spend over $30. Please park in Parkade level P1, P2 or P3 or in the economy lot at YVR. Canada Line at YVR terminus stop. Live music every evening from 7pm to 11pm featuring some of the best entertainers in Vancouver. Globe@YVR is The Fairmont Vancouver Airport Hotel’s award-winning, signature restaurant. Boasting floor to ceiling windows that look out to views of the North Shore Mountains and YVR’s busy runway, Globe@YVR is the only fine-dining restaurant in Richmond to specialize in Pacific Northwest Cuisine and the Ocean Wise Program. Popular for travelers and locals alike, the restaurant features an extensive wine list offering offering a wide selection from around the world including many popular labels from British Columbia’s own Okanagan valley. Enjoy breakfast, lunch, or dinner and experience meals that are masterfully prepared using fresh, locally sourced ingredients. Not worth the price. Barely worth it with the groupon. Highly recommended. Superb birthday lunch for our friend celebrating her 90th birthday. The table, food, ambiance, and service were as always at Globe, top notch. The salad selections were particularly delicious. We appreciate the excellent service by our server Josh who completed the celebration with his attention to detail. The restaurant is fortunate to have such personnel. Our friend felt very special, indeed. We would like to mention the special birthday dessert that was arranged by the on-site manager. We regret not noting her name. Many thanks to all! Absolutely lovely. Our server was exceptional. Accommodated our gluten and dairy allergies, no problem!!! Booked a high tea for 2 with Groupon. It’s our 3rd time here. Food is delish as always. 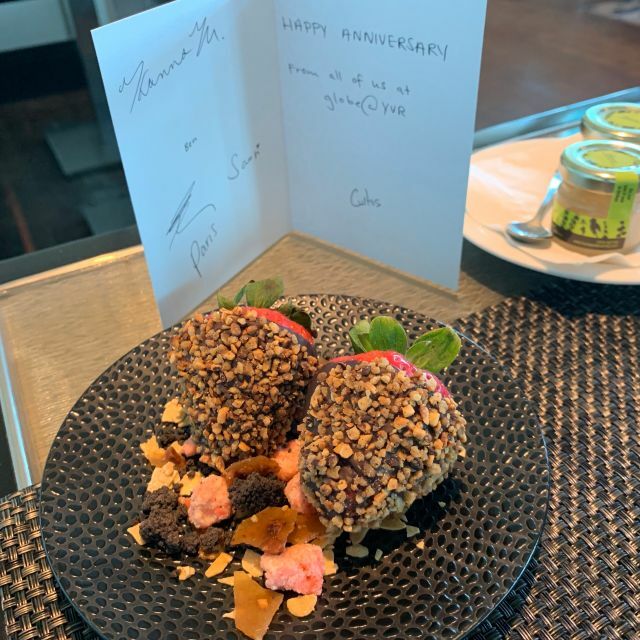 This time they made our day extra especial by surprising us with a greeting card and a extra dessert for our anniversary. Touched by the thoughtfulness of the team! Thank you Fairmont Globe @ YVR! Our table by the window offered a beautiful view of the planes and mountains our waitress was the same one who served me a few other times and she was very attentive and accommodating. When she found out that I disliked smoked salmon and my niece disliked mushrooms, she spoke to the kitchen and adjusted our tea sandwiches. 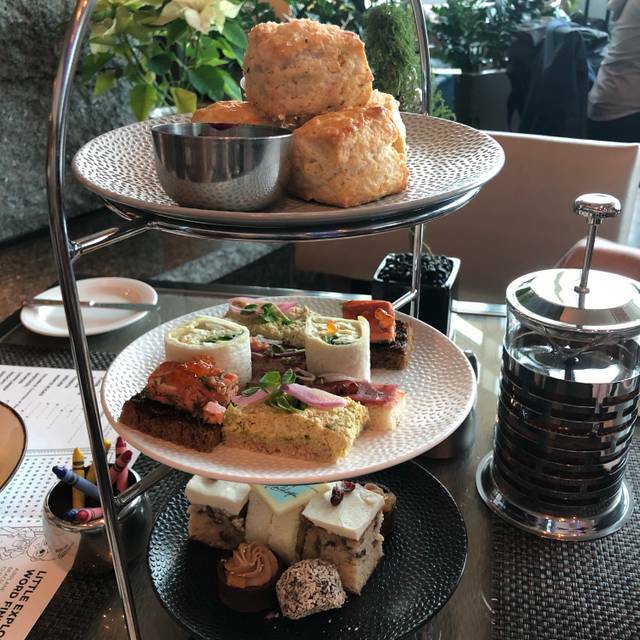 The only thing I missed at our afternoon tea was the use of fine old fashioned china as they have at the downtown Fairmont Otherwise it was an amazing tea. $2 kusshi oysters at happy hour, a nice surprise! Everything individually was OK but certainly not the price tag. Great experience- awesome service. We enjoyed the evening very much! Very nice wine that was recommended and the steak Oscar was amazing!! as always the food and service was excellent. Top price but still worth it. Overall I wasn’t impressed with high tea here. The price was over the top if we didn’t have a groupon and the sandwich selection was disappointing compared to other high teas I’ve been to. I give it a 3⭐️ because our server Josh was great and it has a nice and quiet ambience otherwise i would of score it lower. 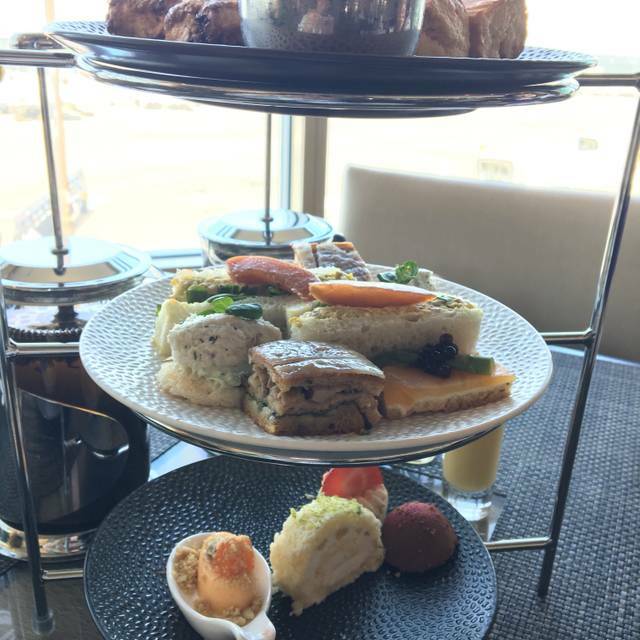 I just didn’t see the value, quality or variety and would not recommend high tea. The staff was very accommodating to various dietary restrictions and incredibly friendly. The food was amazing and the entire experience was definitely worth the price. I'd happily recommend this restaurant and would definitely go again. Always a pleasure to dine here. Quaint, comfy, cozy, yet it is elegant and upscale. Great ambiance and food. The service was a little slow. It took the server a solid 10 minutes to acknowledge us after we sat down. 20 min to get my 1st glass of wine. Overall the experience was good and I will return. Afternoon tea is always a special treat. Great view of the airport. Service was a bit slow but it got me to stay longer than I expected which turned out to be a nice extra. Portion are getting smaller and smaller for high tea but everything tasted wonderful. Wonderful service. Conveniently located in the Fairmont Vancouver Airport. Surprisingly quiet, considering it's literally in the airport. Lovely dinner! I ordered a steak sandwich and was given a steak. Instead of bringing me bread (which I would have been fine with), they made a steak sandwich. This steak sandwich took awhile to make and arrived blue (I ordered medium rare). My friend had already waited a long time to eat and we didn’t have enough time to send it back so I ate it as blue (not my favourite). They didn’t charge me which I appreciated but expected that given the mistake. Went to Fairmont for High Tea with a friend. It is a good place to watch planes, and conversation. It is quiet with a nice fire going for ambience. What I found is the price you pay for what you get is high. The service is excellent, they are accomodating. Food quality excellent. Just the choices were minimal. The food for afternoon tea was not fresh or appetizing at all. Looked like it had been prepped and left out for long time - dry. Tea and service were great. 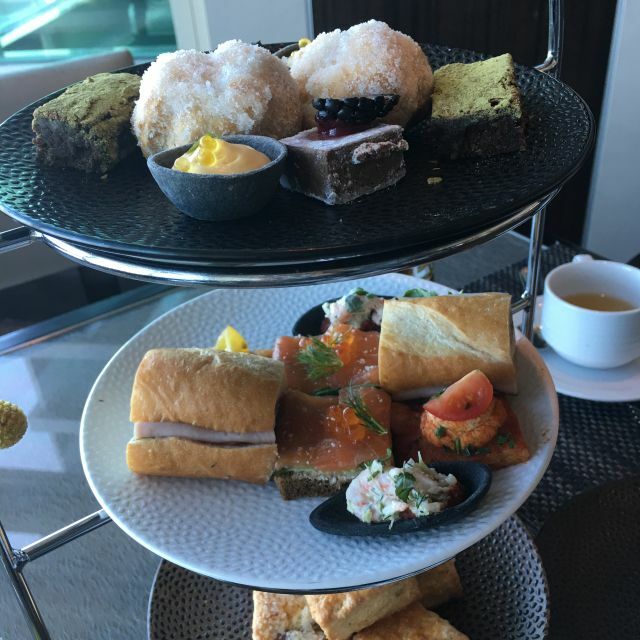 Would not recommend the app afternoon tea even if free! The food is pretty good here and outstanding service. What I really like is they offer free parking up to 2 hours if you spend over $30. Just let your server know and they will give you a voucher to give to the parking lot attendant. Great view of the US terminal and the mountains north of BC. I'll be back to try their afternoon tea. We came here after a ski trip 5 years ago and had a great night. Beautiful food, atmosphere and service. This time the food was average at best. $50 for an over cooked steak, $36 for a dry burger. Located at YVR, the retaurant's most striking attribute is its convenience for clients staying overnight to catch early flights. Very expensive relative to the quality and taste of food and drinks and incredibly noisy. A reservation for four nets you two possible tables - one on the aisle with a table so small it barely holds the plates for everyone and an even smaller one with a view by the window. Would I recommend? The hotel - absolutely. The restaurant - nope. Lunch at Fairmont at YVR. Lentil burger and salad. Nicely presented. Burger itself lacked flavour and was luke warm. Would like to see more vegetarian choices. We like the bar and the restaurant. Convenient, nice and quiet, good atmosphere and excellent service. very very good place for high tea!!!! this is the third time we have been.. The server was polity but not attentive. Price wise it is stupid expensive for what we get. Overall it is a good experience for a special date but not affordable whatsoever. Fresh ingredients. Dishes are tasty. Didn’t expect this level of cooking before I went. A little short staff and needed to wait for the food. The beer and honey bread is so yummy!!! Must try! Our server, Josh, was wonderful and made sure to answer any questions my curious boyfriend through at him (about tea). We had a wonderful chocolate raspberry mousse cake-type dessert complimentary because it was my birthday, and we really appreciated it! Loved the tea - it was top notch. We were also impressed with the curried chicken on bread bite. The food was quite good, ranging from mediocre to excellent, with most being smack in between. The scones were delicious. Overall, a wonderful experience, though the highlight would undoubtedly be Josh’s excellent service! Excellent food, great service, very relaxing atmosphere. Awesome high tea with a perfect view.....so calm and scenic! 10 out of 10 for service because free parking is provided up to a maximum of 3 hours while you dine at this scenic restaurant with awesome food! Go for a nice afternoon tea...it's so worth the drive there! I had green tea and cream early grey and they both tasted horrible. High tea’s pastries quality was very low. None of them were delicious at all. View would be excellent during the day if you are a "plane nut", food was excellent and service was outstanding, but that couldn't make up for high noise level - neighbors the lounge with live music and conversation was difficult. So while I can recommend for the food and service the noise level prevents a classification of a fine dining establishment. It was convenient and delicious to dine at the airport Fairmont after checking into the hotel. The three of us had three different main courses and each of us said we thought we had the best dish! I enjoyed the silky sablefish, another bragged about the lamb shank with rosemary polenta, and the third savored the scallops with mushrooms. Ravioli was cold inside and came back a second time cold inside the pieces so they need to fill those flatter and wider so their heating process penetrates. The bone marrow was a nice touch. A very busy place so all considered the service was great under full house conditions and server, manager and hostess all aimed to please. Overall, not sure I’ve ever experienced better at an airport hotel. Our family loves a great breakfast/brunch buffet and this one did not disappoint. The selection was very good and tasted great. Although the weather was rainy, it was nice to watch the planes and dream about flying off to some exotic locale. The service was prompt, friendly and professional - everything you would expect from a Fairmont Hotel. We went for the breakfast buffet. The selection was good and tasty, but a lot of the food wasn’t hot (it was actually pretty cold). By time we went for seconds, certain dishes has been replaced with freshly cooked, hot dishes, but I’m not sure how long the first dishes were sitting out for. Needless to say, the food didn’t agree with 3 of us and luckily we were going straight home. Another selling point is that there is an omelette chef that will make omelettes when you go up and ask; for the hour that we were there, the chef was at the station for around 5-10 minutes. 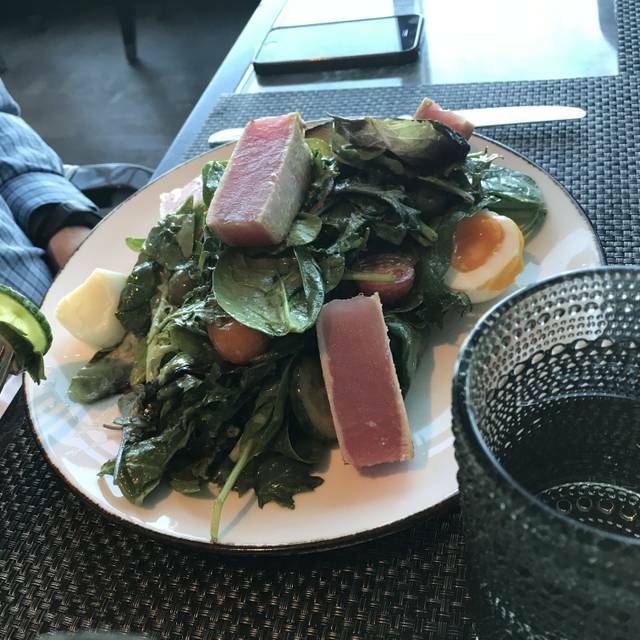 At $33 a person, I wouldn’t go there again if the food was the same, and definitely wouldn’t recommend going there if you’re going to be stuck on a plane for several hours after. I don’t know if we caught them at a bad time, but it was a Saturday morning at 10am, so there’s really no excuse for cold dishes. The flip side is that the waiter paid a lot of attention to the table, and the view of airplanes leaving gates was cool.